Siân Ede’s “Science and the Contemporary Visual Arts” provides an initial analysis of the correlations and relationships between art and science and some people involved. In doing so, she categorizes why artists involve themselves in the field of science which are: highlighting the challenge of materials, the fascination of scientific paradigms, the artist’s ability to assist with scientific investigation, and the need to explore the political and ethical consequences of science. Ede applies her theory to numerous artists who utilize aspects of science throughout their art production like Helen Chadwick, Ackroyd & Harvey, William Latham and more. In her categorization, I can not help but wonder if she is putting an unintentional higher importance on science and possibly categorizing contemporary visual arts as a subcategory as she shows a somewhat bias opinion in stating that she has a better understanding of science and wishes to grasp a greater comprehension on concepts of art. Ede compares and categorizes rather than express the interconnectivity between science and art. “In pitting art against science, therefore, we were hoping to learn more about art and its role in our lives, besides exploring how it reflected new discovery in science.” (Ede 66). Art does not always have to be a reflection of science; I see it as a contribution. In regards to the public sphere and the commodity that comes with it, Ede states that the decorative aspect of art could be a financial contributor to science organizations in promoting public understanding of science. And with public understanding, comes a larger appreciation for science through art. “What has become clear, however, is that a good way of attracting the interest and time (or even money) of science organizations and scientists is to emphasize the value of art in promoting the public understanding of science, with ‘public understanding’ taken to mean better knowledge and appreciation of, and greater support for, science.” (Ede 67) As a preexisting public form of bringing communities together, art can lend its creative hand in publicly popularizing science? 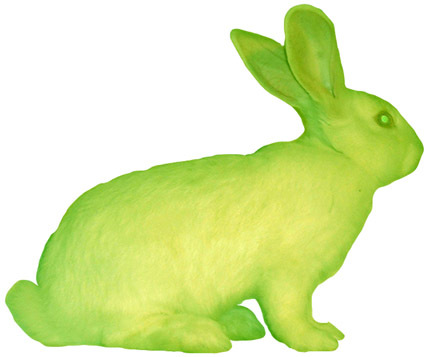 GFP Bunny is a transgenic artwork that comprises the creation of a green fluorescent rabbit, the public dialogue generated by the project, and the social integration of the rabbit. To broaden on that rare occasion she states, a prime example of art assisting in scientific investigation would be Natalie Jeremijenko’s OneTrees project where she cloned 1,000 trees as a way to express genetics’ complex interaction with environmental influences. Because they are clones, once placed in a certain public area, they will grow to show social and environmental differences to which they are exposed. Dalton Conley talks about this project in “Pairwise: ONETREES and the Legacy of Human Behavioral Genetics” and expresses Jeremijenko as experimenter who not only shows environmental differences with biological growth, but contributes her findings to notions of nurture vs. nature. “By planting genetically identical trees in various environmental conditions—toxic ghettos and manicured suburbs—we can attribute the systematic differences between the sites to the impact of ‘nurture’ and the similarity across sites of ‘nature.’” ( Conley 26) Jeremijenko used creativity and not just statistics to show the public the influence and levels of toxicity of their environment. Jae Rhim Lee is a visual artist who is interested in human biological occurrences. In this particular TED talk, Lee investigates the notion of decomposition with her “Infinity Burial Project.” This project explores human choices after death and the complications that come with it. 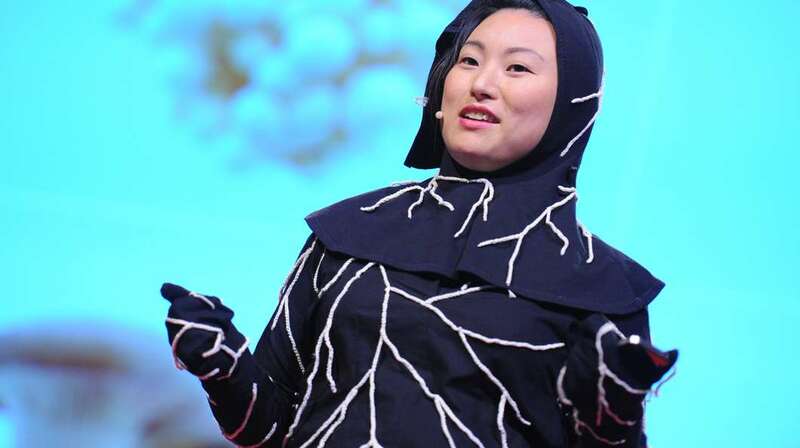 With developing a new strain of fungus, Lee develops a burial suit that integrates the Infinity Mushroom in which feeds on and remediates the industrial toxins we store in our bodies and convert our decomposing bodies into nutrients, turning a death into clean compost. Ede, Siân. 2002. “Science and the Contemporary Arts.” Public Understanding of Science 11 (1): 65–78.